Case Example 8 - Matthew D. Hepler, M.D. 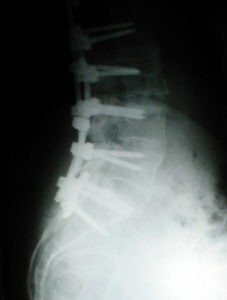 61 yo woman with progressive scoliosis with low back and leg pain. Case review: 61 yo female with progressive curve since adolescence and worsening low back and leg pain refractory to non operative care including pain medications, PT, and ESIs. Preop xray demonstrate triple major curves of 39, 81 and 60 degrees, coronal decompensation, and elevated right shoulder and MRI demonstrated severe lumbar stenosis. Patient was treated with anterior release (osteotomies) and fusion followed by posterior release (multiple osteotomies), lumbar decompression, fusion, instrumentation from thoracic spine to the pelvis. Postop xrays demonstrate curve correction and restoration of spinal balance with resolution of back and leg pain.